← Upcoming IPM Workshops for Landscape, Arboriculture and Garden Centre Professionals! Seeing holes in leaves on deciduous trees? This sugar maple was showing interveinal holes and closer inspection revealed fall cankerworm (Alsophila pometaria) larvae on the leaf undersides. Larvae are pale green (although you’ll often see darker races too) and blend in with newly emerged foliage. They are about 8-12 mm long right now but can they eat! Oye. Where populations were high last year, monitor for larvae on several hosts such as Acer, Celtis, Fagus, Tilia, Quercus, Ulmus etc. A foliar application of the bio-insecticide Dipel (Bacillus thuringiensis, B.t.). can help to significantly reduce populations and subsequent injury. Click here for a video. You can often find fall cankerworm larvae suspended by threads that dangle from leaves… or crawling on your shirt during a nice spring walk (Photo: Chris Hsia). Everyone was complaining about them in the greater Hamilton/Ancaster area last spring. For great images and management information check out our free scouting App Bugfinder, on Apple and Google Play! Seeing holes in newly emerged leaves but all you can find are dark, fuzzy little caterpillars? Gypsy moth larvae have also begun to feed. Look for holes in leaves and turn over inspect leaf undersides for tiny larvae. We often see both Gypsy moth larvae and cankerworm larvae feeding on the same leaves. Gypsy moth larvae may also hide in bark crevices during the day (Photo: Gypsy moth larva on Fagus sylvatica, J. Llewellyn). There are pockets of heavy forest tent caterpillar populations, especially in eastern Ontario. This insect is a periodic pest of maple syrup sugar bushes and of deciduous forest stands, as well as urban trees. Manage larvae with foliar applications of the bioinsecticide Bacillus thuringienesis (B.t., Dipel, Foray). 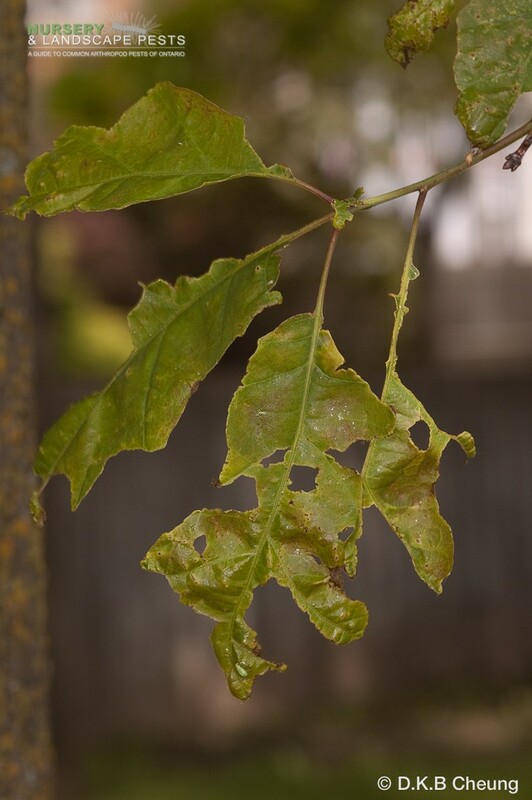 This entry was posted in Arboriculture, Insects, Weekly Nursery Landscape Report and tagged biocontrol, bugfinder, dave cheung, fall cankerworm, gypsy moth, Jen Llewellyn. Bookmark the permalink.